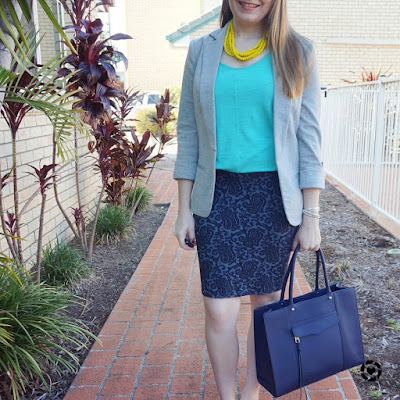 Peplum Tops, Pencil Skirts & Rebecca Minkoff MAB Tote | Weekday Wear Linkup! 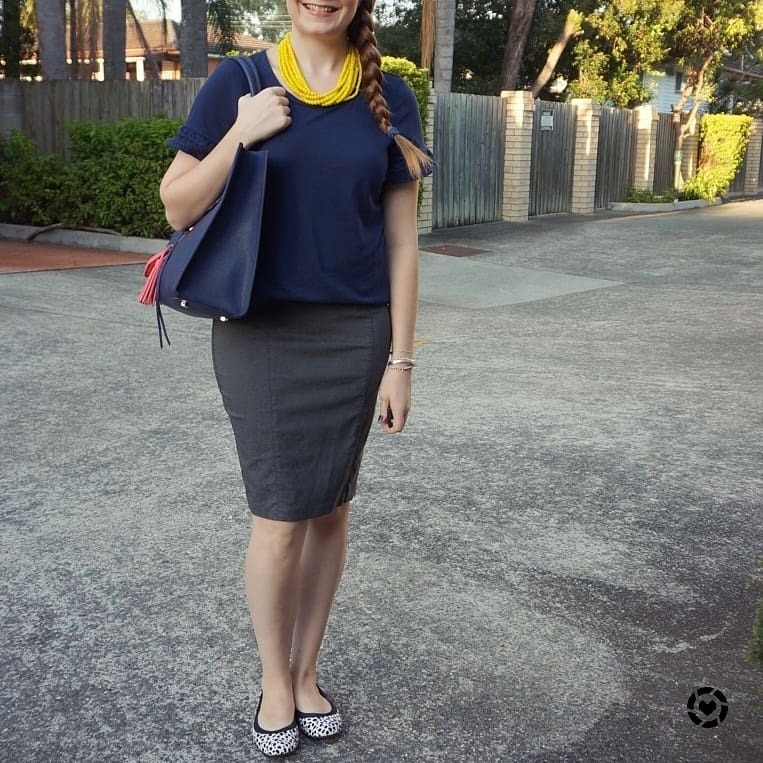 It's the Weekday Wear Linkup, with some office style! Keeping things simple for my return to work after a bit of a break, I stuck with an outfit combo I've worn before. 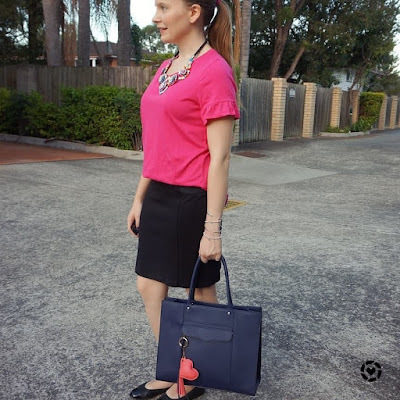 Peplum tanks and pencil skirts, easy office style and just what you need after a few weeks leave over Christmas (I wore these mid-January). Last time I wore this skirt I mentioned how much I wear it with black - the fuzzy polka dots just make black an obvious pairing! 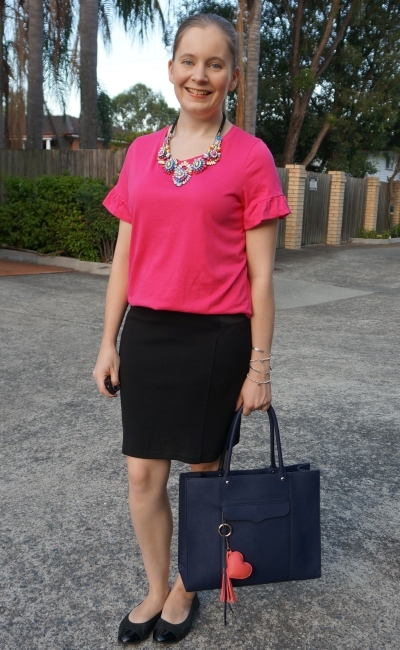 I thought the peplum tank and textured pencil skirt would be a fun combo, but still good for a busy day at work. It was a bit of a weird day, with wind and rain forecast but also quite humid so I added this bird print scarf onto the handles of my Rebecca Minkoff MAB bag in case I needed it later with the rain. It actually started raining just after I took these photos! 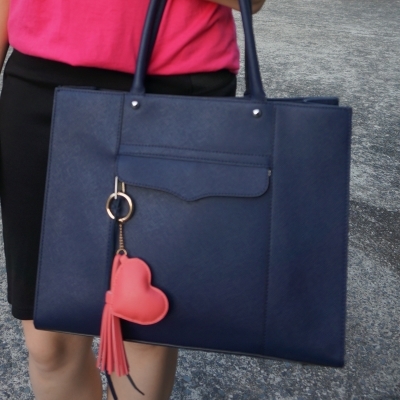 With the black and pink, I decided to wear accessories that would match the navy bag for a third colour in my outfit. I loved the tassel earrings and tassel necklace together, both are Christmas gifts. Only downside was that the statement earrings kept catching on my braid. I have to remember to wear simpler pieces when I have my hair braided on the side like this! 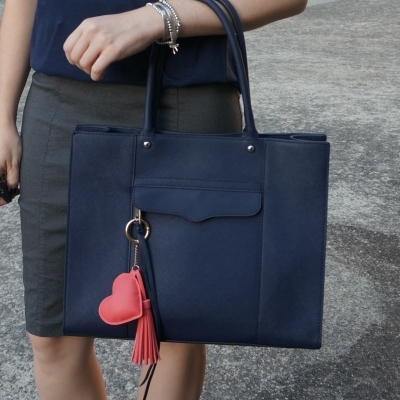 Last worn: navy and gold tassel necklace, pink polka dot pencil skirt, black ballet flats, Rebecca Minkoff MAB tote bag. First time I've worn the peplum tank and scarf. 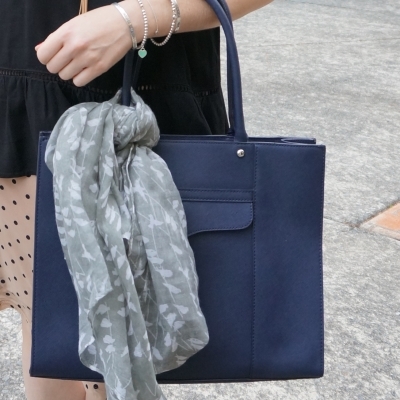 Other ways to wear: pink polka dot pencil skirt in winter, black ballet flats and jeans, Rebecca Minkoff MAB tote bag and sheath dress. 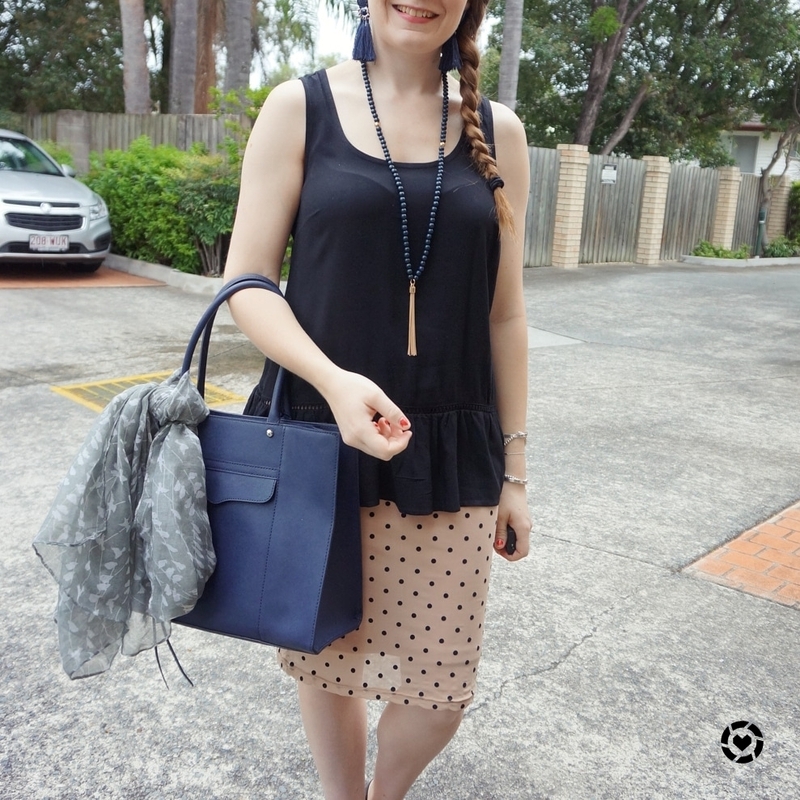 Perfect for pregnancy: pink polka dot pencil skirt in first trimester, black ballet flats in second trimester, Rebecca Minkoff MAB tote bag in third trimester. Once again, repeating the outfit formula above as I liked it so much. 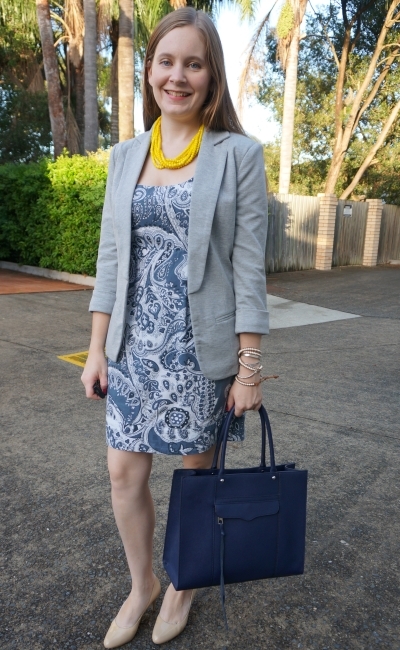 This time around, with a printed tank and a plan pencil skirt. And a simpler hairstyle, as I picked grey tassel earrings to match the pencil skirt and the blazer I brought along for meetings. Like the outfit above, it was both a humid and rainy day so I didn't add the blazer for the pics, but it really dressed up the outfit in the office. A grey jersey pencil skirt and a grey jersey blazer together looks very formal, even with a fun printed peplum tank in the middle. Picked a bright pink scarf to accessorise. 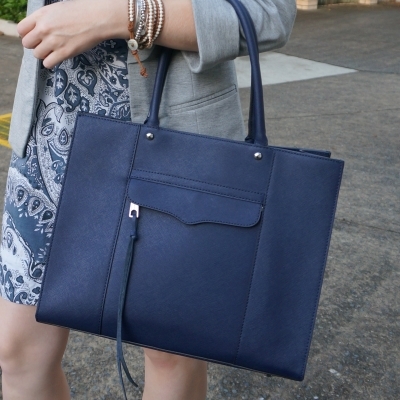 This crinkle one didn't get any wear during the day with my blazer worn in the office aircon instead, but I loved how it popped on the bag! 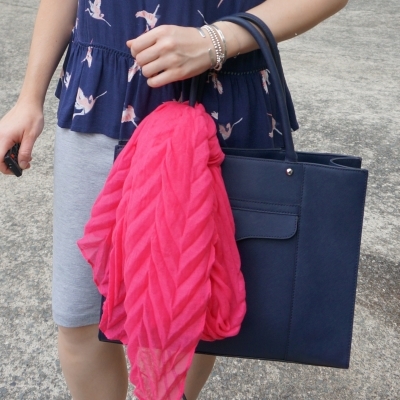 Last worn: silver tassel earrings, coin pendant necklace, pink crinkle scarf, bird print tank, jersey pencil skirt, silver bow ballet flats, Rebecca Minkoff MAB tote (above). 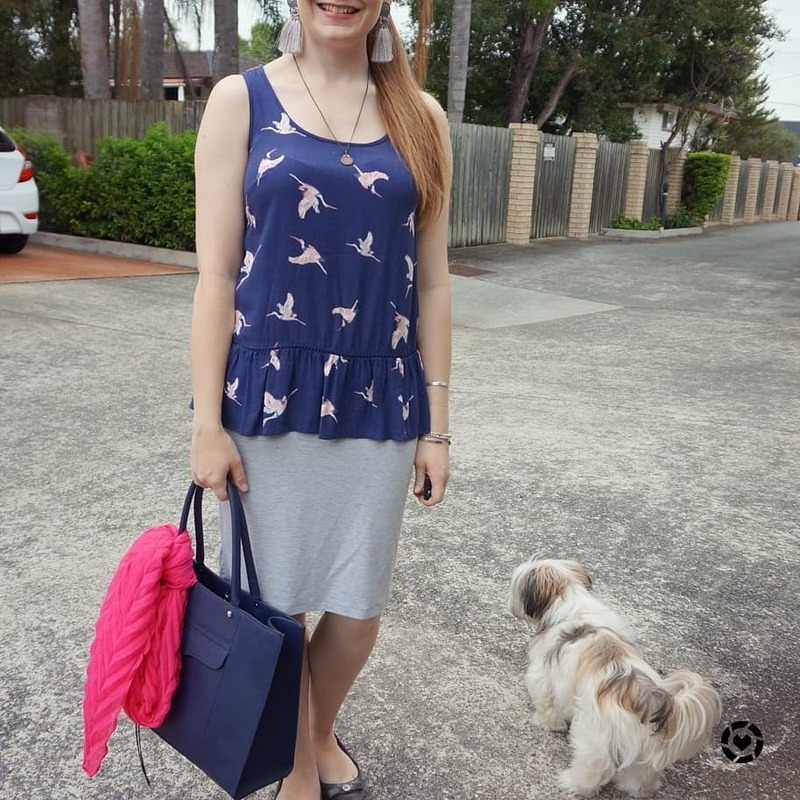 Other ways to wear: bird print tank and olive jeans, jersey pencil skirt worn two ways, silver bow ballet flats and little black dress, Rebecca Minkoff MAB tote in winter. 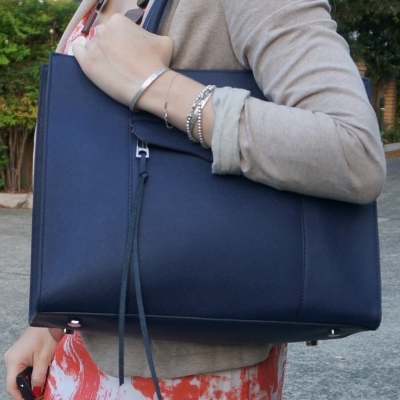 Perfect for pregnancy: jersey pencil skirt in third trimester, silver bow ballet flats in third trimester, Rebecca Minkoff MAB tote in first trimester. A peplum tank is a flattering option, and it is such a cute touch to have a little extra frill on a basic tank. Paired with a pencil skirt (with a blazer on top if needed to meet stricter office dress codes) it makes a simple feminine office outfit. 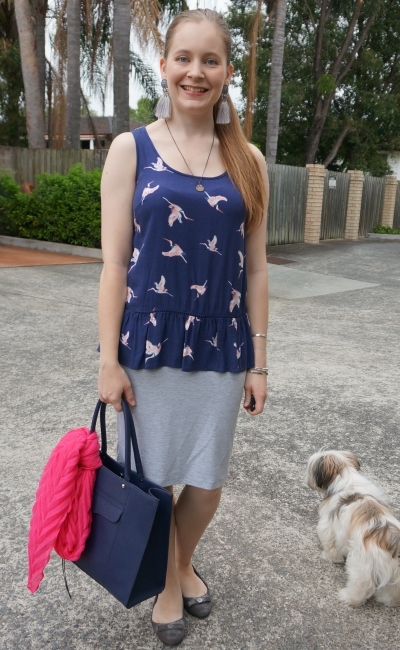 You can go with something plain, or pick a printed tank for a little more interest and colour. Linking up with Style Sessions, Turning Heads, Trend Spin, Style On The Daily, Fashion Frenzy., Oh Hey Girl. 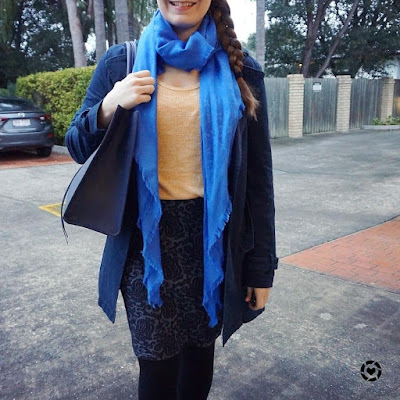 Sharing some colourful but still very cosy winter outfits, with my favourite blue pencil skirts and a big Rebecca Minkoff MAB tote bag. When our winter temperatures dipped again, I wanted warm knits, and picked some of my bright ones to inject a little colour. Plus, an update on how I did with my No Buy July challenge, #noBuyJuly18! 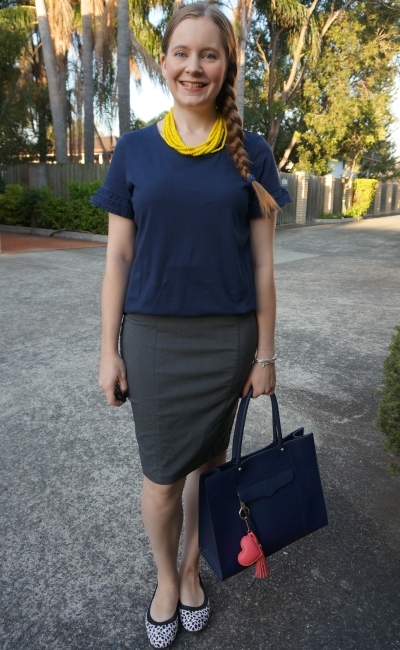 Trying blue and yellow with a mustard marle knit, blue scarf and blue pencil skirt. 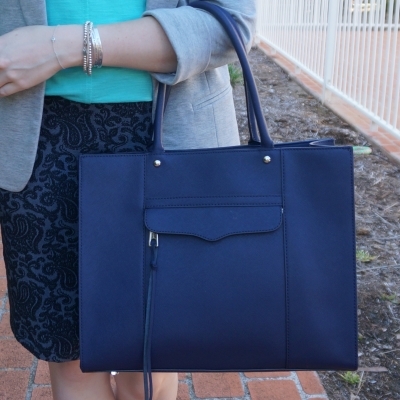 Decided to wear the Rebecca Minkoff medium MAB tote as I love wearing blue bags with this pencil skirt, it's a frequent go-to combination. While I do normally like blue and yellow together, I wasn't sure if this skirt and knit would look as good as I hoped together. I ended up really liking this outfit, I think the scarf really made it perfect for me. This was such a comfortable outfit too, very much appreciated for a crazy day at work where nothing went according to plan at all! 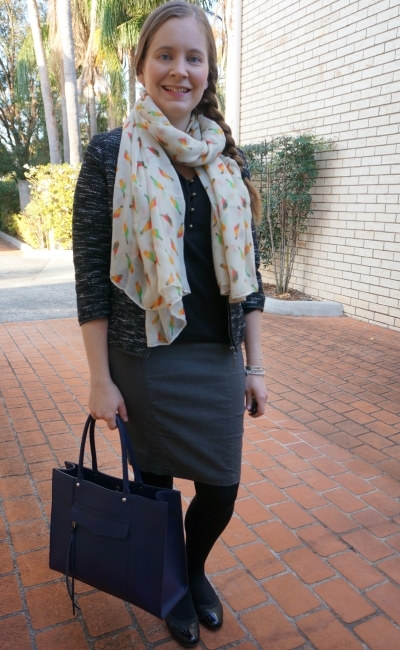 Last worn: navy macintosh, Louis Vuitton scarf, mustard marle knit, jacquard pencil skirt, black ankle boots, Rebecca Minkoff MAB tote bag. Other ways to wear: navy macintosh and wrap dress, Louis Vuitton scarf and embroidered top, mustard marle knit and a-line skirt, jacquard pencil skirt in summer, black ankle boots worn 30 ways, Rebecca Minkoff MAB tote bag and grey pencil skirt. 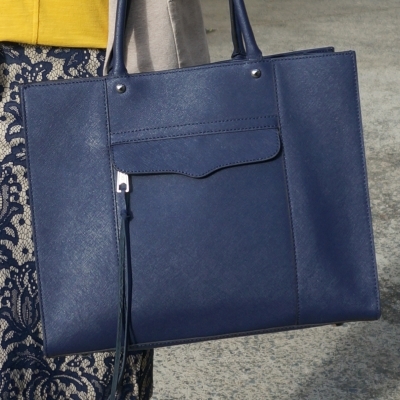 Perfect for pregnancy: jacquard pencil skirt in first trimester, ankle boots in second trimester, Rebecca Minkoff MAB tote bag in third trimester. 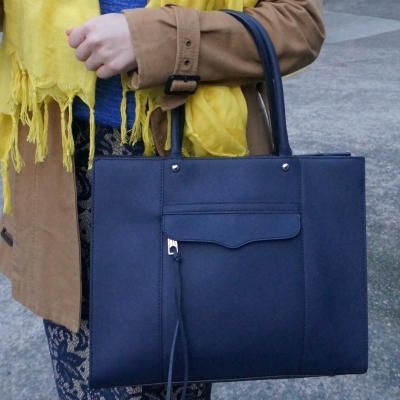 What's In My Bag: Rebecca Minkoff Medium MAB Tote Edition! Again continuing the blue and yellow theme! I really do like the colours together. I felt like all of the blue together wasn't quite colourful enough, so I added this cosy and bright yellow scarf. This knit and pencil skirt is a combination I've worn before in the warmer weather, it was good to be able to layer it up for winter. Unlike the previous week at work, I had to wear my trench coat when I ventured out for coffee with my boss in the morning and lunch in the afternoon. It was a much cooler winter day. While the bright yellow scarf is a fun summery shade, the big size makes it very warm and very cosy to wrap myself up in during winter! 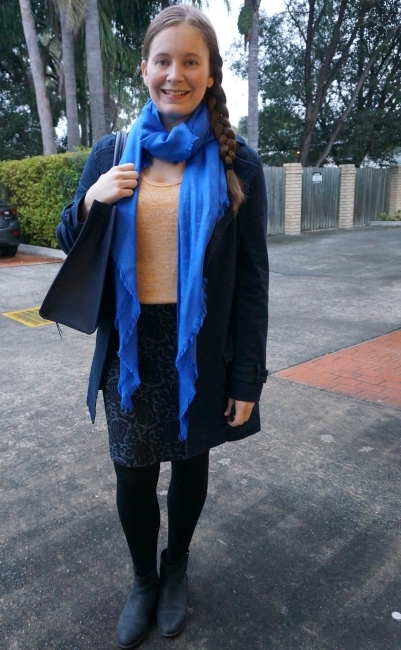 I like blue and yellow together so it seemed like a fun choice for a cold morning to repeat the colour combo again. Usually when it's cold I'll add ankle boots to my outfit, but I felt ballet flats were better for all the running around I had to do in the morning. It was one of those days where you come into work with an idea of what task you're going to do, then the afternoon rolls around and you realise you've been pulled in so many directions you hadn't started your task! 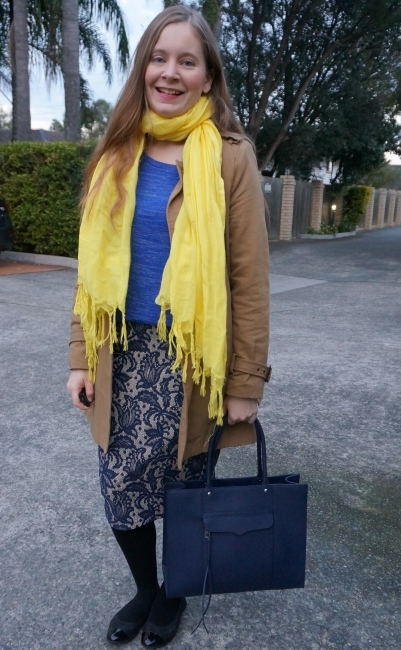 Last worn: camel trench, yellow scarf, blue marl knit, blue lace pencil skirt, Walnut Melbourne flats, Rebecca Minkoff MAB tote bag (above). 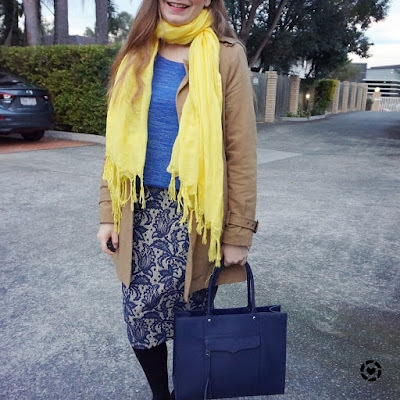 Other ways to wear: camel trench and burgundy pants, yellow scarf and maxi dress, blue marl knit and skinny jeans, blue lace pencil skirt and grey tee, Walnut Melbourne flats and skinny jeans, Rebecca Minkoff MAB Tote Bag and maxi dress. 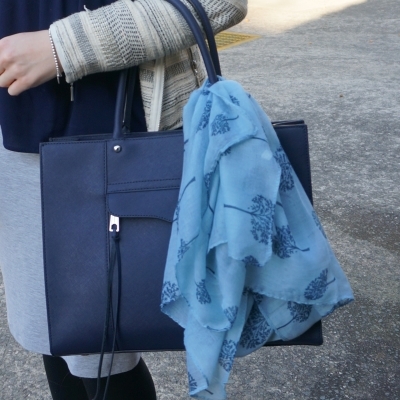 Perfect for pregnancy: camel trench in second trimester, yellow scarf in second trimester, blue marl knit in first trimester, blue lace pencil skirt in third trimester, Walnut Melbourne flats in second trimester, Rebecca Minkoff MAB tote bag in second trimester. It might not come as a surprise, after I mastered 7 months without shopping last year, but I made it through #noBuyJuly18 sticking to my goal and not spending anything on fashion. July is such a busy time with all of the sales, but I'm pretty content with my winter wardrobe now (even after halving my winter pieces from two storage boxes to one), and that makes it easier to avoid the sales. Some of the sales were extremely tempting, but even with the $5 sale at Jeanswest (!) I didn't buy anything. For full disclosure, I did add a few things to carts but decided not to buy at the last minute. I shared more tips for how to survive a no shop challenge after completing 6 months without shopping: lessons from a former shopaholic. Winter wear works well in neutral colours, as you can layer without worrying about colours matching. It's a fun idea to add some colourful pieces though, from bright scarves to colourful and cosy knits, you can still be cosy and warm! Sticking with colour combinations you know you love, or adding a contrasting scarf to a monochrome outfit, is a good way to try it out. Linking up with Modest Monday, Trend Spin, Turning Heads, Confident Twosday. 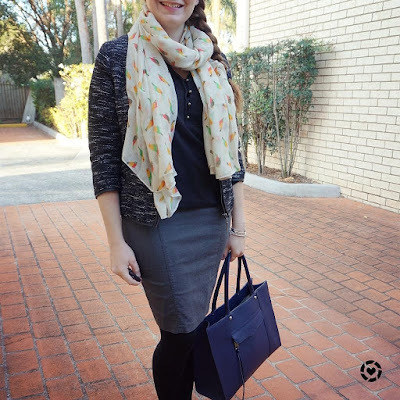 While I'm still on leave, I haven't shared these outfits from before the Christmas break yet! Summer in the office is usually pretty relaxed, when the heat gets too much they often change our already business casual dress code to be even more casual. If I'm worried my outfit is a bit too casual though, even with relaxed dress codes, I add a blazer, just like I've done in both outfits below. I'd just worn this blue tank a few days before, but wore it again to the office to squeeze in one more wear before the month ended, to meet my 'wear things twice in the month I buy them' goal. It's a great casual top, so I added the blazer to ensure it would work for the office as well. 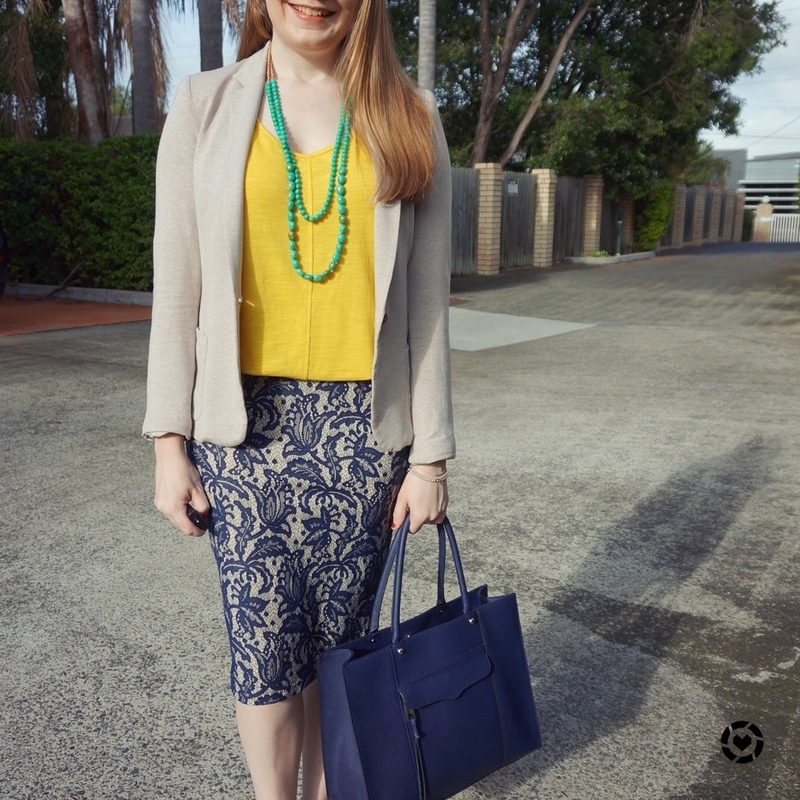 Although the turquoise tank and the navy skirt are very different blues, I thought they would look great together, and I couldn't resist adding this colourful yellow statement necklace for even more colour. I really liked all the colours in this outfit together. 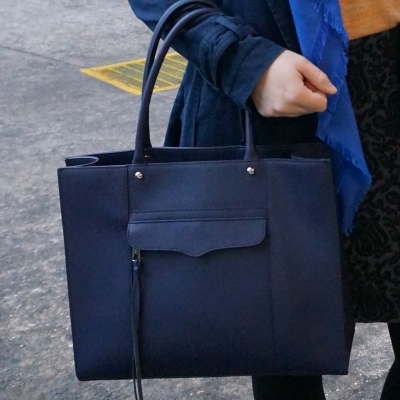 The neutral black ballet flats and grey blazer were good accessories, and my Rebecca Minkoff navy MAB tote matched the jacquard pencil skirt well. 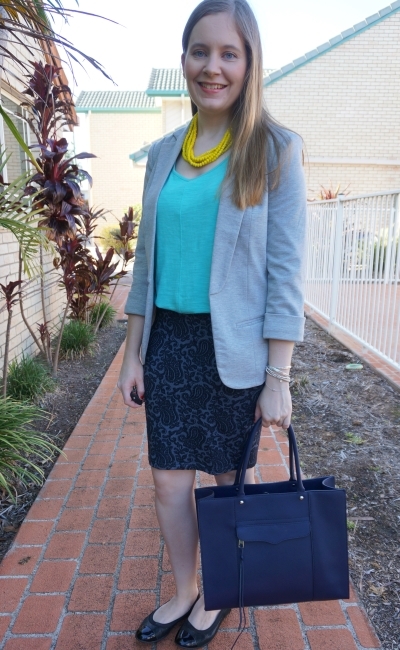 Last worn: grey blazer, turquoise tank, navy jacquard pencil skirt, Walnut Melbourne ballet flats, Rebecca Minkoff medium MAB tote. 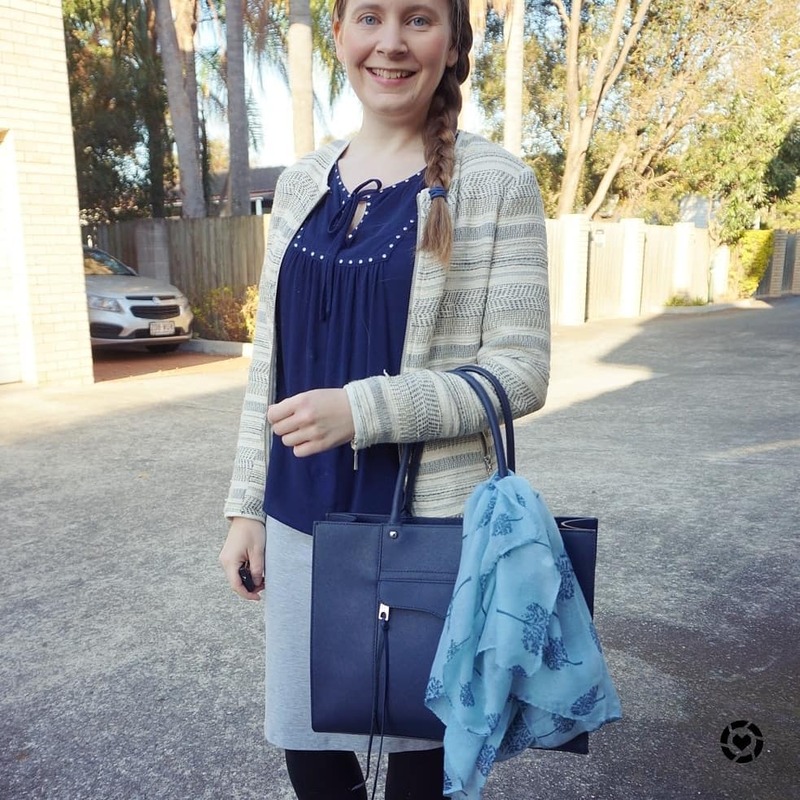 Other ways to wear: grey blazer and fit and flare dress, turquoise tank and printed shorts, navy jacquard pencil skirt and winter layers, ballet flats and skinny jeans, Rebecca Minkoff medium MAB tote and maxi dress. 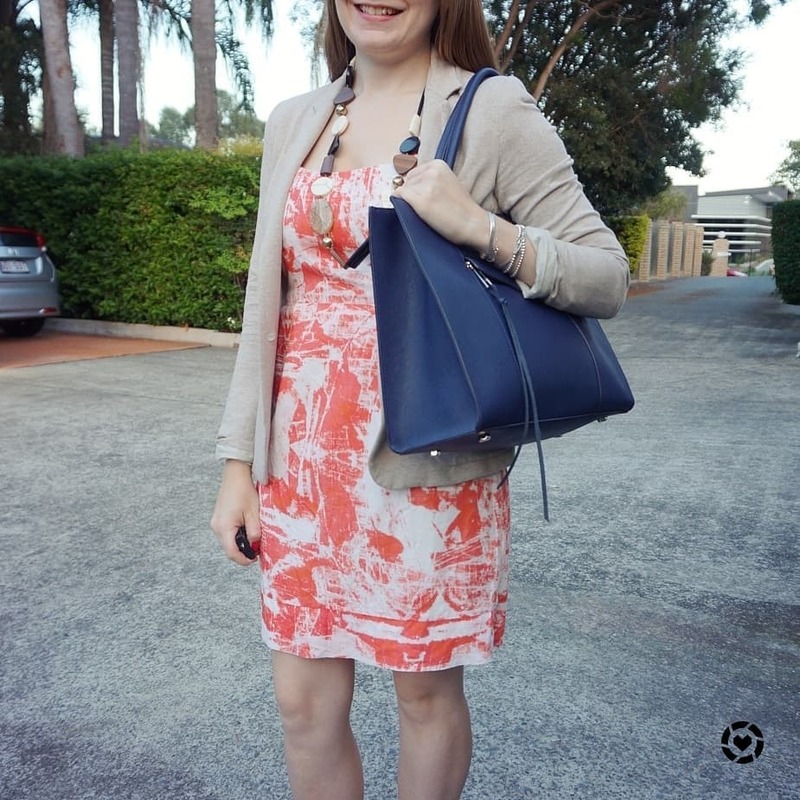 Perfect for pregnancy: navy jacquard pencil skirt in first trimester, Walnut Melbourne ballet flats and wrap dress, Rebecca Minkoff medium MAB tote in third trimester. Wasn't quite so sure about all the colours in this outfit. I love yellow and blue together, and the green necklace is great with the yellow tank...but I think that something was off about this outfit, I didn't like it as much as the blue one above. Getting woken up far too early by baby boy and being too tired to consider my outfit properly that morning may have impacted how I felt about it, ha! I am always harsher with my outfits if I'm not having the best of days. I was hoping for an easy day at work for being exhausted before my day even began, but when I realised it wasn't looking that way I popped out to Starbucks for a little morning tea treat between meetings. Thankfully my day improved when I got home, it's impossible to have a bad day when you get excitedly greeted by 2 little boys and a very fluffy dog. 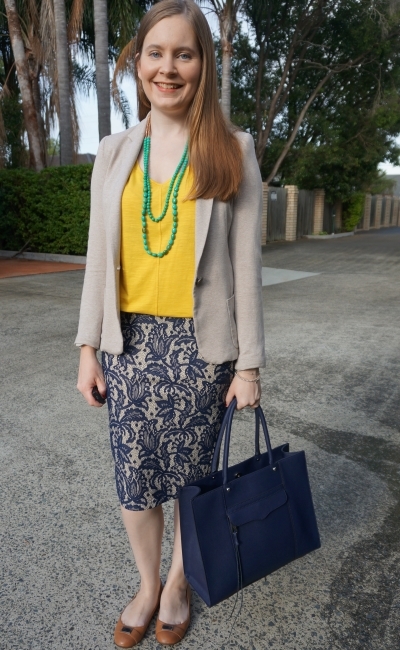 Last worn: cream jersey blazer, mustard yellow tank, ASOS lace pencil skirt, camel flats, Rebecca Minkoff navy MAB tote (above). Other ways to wear: cream jersey blazer and skinny jeans, mustard yellow tank and printed shorts, ASOS lace pencil skirt in monochrome outfit, camel flats and sheath dress, Rebecca Minkoff navy MAB tote in winter. 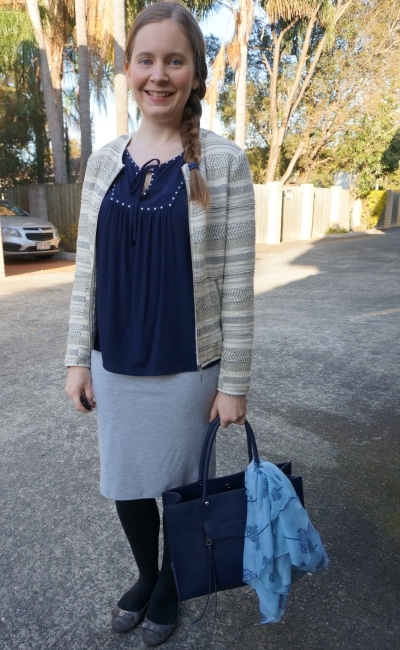 Perfect for pregnancy: cream jersey blazer and hidden baby bump, ASOS lace pencil skirt in third trimester, camel flats in second trimester, Rebecca Minkoff navy MAB tote in third trimester. Your casual summer tanks can easily do double duty in the office when worn under a blazer and paired with a classic pencil skirt. If you're worried a bright tank may be too bold for your office, try picking neutral layers and accessories to wear with it. 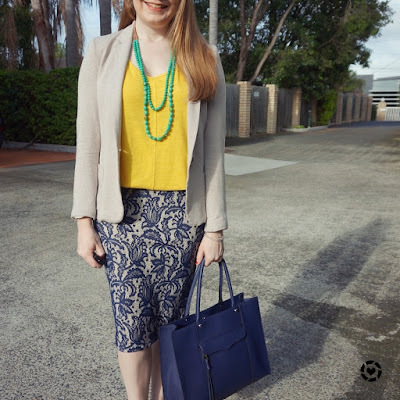 A blazer definitely isn't needed in the middle of a Brisbane summer, but you can easily take it off for the commute and slip it on to combat the cold aircon at your desk in the office. 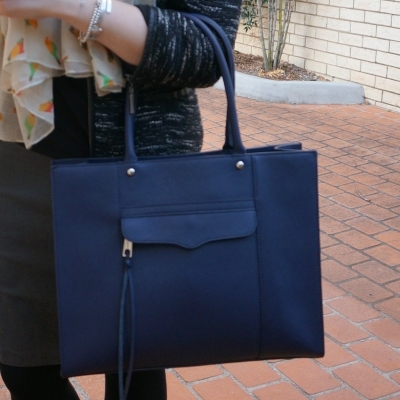 Such a simple layer to make any outfit feel more pulled together and office appropriate. 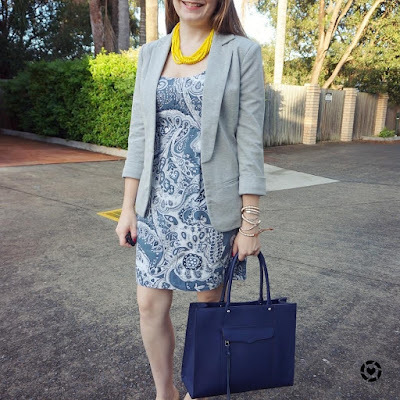 Linking up with On Trend, Turning Heads, Trend Spin, Confident Twosday, Style Sessions.